In the vein of thrillers like Predator and An American Werewolf in London, Dog Soldiers follows a band of soldiers. While on a routine military exercise they must battle deadly, violent beasts preying on their blood. I recently saw Dog Soldiers, and I was pleasantly surprised. It deals with a small military squad, that unexpectedly finds itself in a defensive action against a pack of werewolves. It’s reminiscent of Night of the Living Dead, with interesting characters thrown into a very deadly situation. And most of them don’t survive it. Despite being heavily armed, it doesn’t matter — conventional injuries don’t harm the werewolves. At best, it causes them a moment’s distraction. 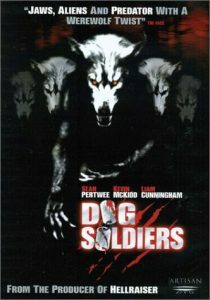 Dog Soldiers also has a bit of Alien, as injured soldiers eventually turn into werewolves and are forced to join the pack. This leads to an excellent moment toward the end, as the leader, turning into one of the pack, has a final act of defiance of a free man. And takes several of the werewolves with him. And there are some other nice touches, such as the pretty young zoologist who helps them. Doesn’t she? If there are any negatives, it would be the copious amount of bad and vulgar language. But, what can you expect from soldiers being assaulted and murdered by man-eating werewolves? In all, Dog Soldiers is a very good werewolf movie, that I enjoyed very much. I rate it 3 stars out of 5.